Contact the supplier, see the service telephone number on the printer in question. Remember to state the printer's number. Delivered automatically, but can be ordered directly from the supplier, see the service telephone number on the printer. Remember to enter the printer's number. Contact Ricoh on the service telephone: 22 58 78 00. Remember to state the printer's number. Install Pullprint printers for Mac OS X. 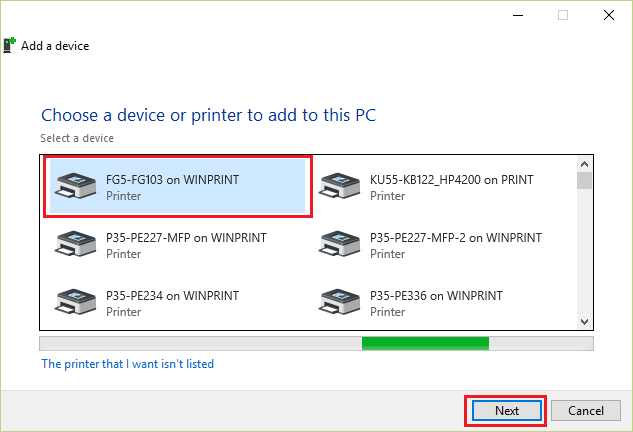 Install Pullprint printer for Windows. Install Pullprint printers for Linux Ubuntu. Print from mobile units on campus. Printer overview (Pullprint) campus Pilestredet. Printer overview (Pullprint) campus Kjeller. Pullprint are printers equipped with a card reader that authenticates the students’ and employees’ admission cards. The print queue is called Pullprint and consists of a network of printers. The printout can be obtained from any one of these. Pullprint is the actual printing part of Safecom; the printing and payment system used at OsloMet. You choose when and where to retrieve your printout by going to one of the printing points. This only applies to Pullprint printers with mounted card readers. Documents sent to the Pullprint queue will remain for 24 hours before being deleted from the Safecom server. Printer overview on campus Pilestredet and Kjeller. The printer service is provided by the supplier. Ricoh and Sharp printers, i.e. multi-function printers (MFP), are marked with the contact information needed to order the service. Remember to state the printer number / individual number of the printer when contacting the supplier service. Toner cartridges should be delivered automatically by the supplier before they run out, but they can also be ordered directly by phone if necessary. See the contact information of the various suppliers. Contact BIT if your department / unit has an HP printer as a shared printer. BIT only supplies toner cartridges to shared HP printers. BIT does not provide service or toner change for local printers located in the offices. The department / unit is responsible for the local printers, and the unit must contact the service / toner supplier itself. All Ricoh printers with card readers support colour printing, but only multi-function printers (MFP) support A3 paper size, scanning and copying. Fax is not available on our multi-function printers. Please contact one of the receptions on campus to send faxes. Search for "Printers" (or "Skriver" if the language on your PC is Norwegian) in the search bar in the taskbar. Click: "Add a printer or scanner"
Find "Pullprint on print" in the list of printers. 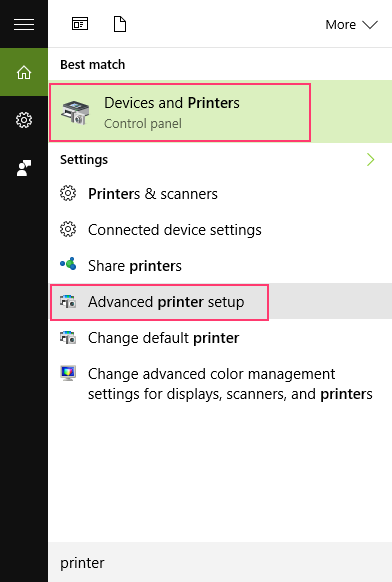 Click on "Add device" - Pullprint is set as the default printer. 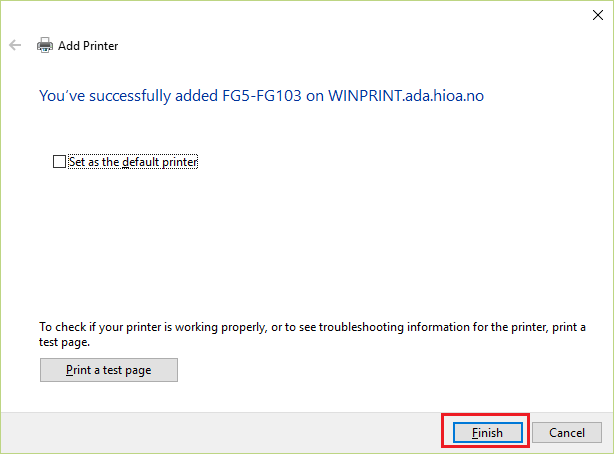 In the search box type: "Printer" - to install another printer (local printer) at OsloMet. Find: Local printer / printer in your building / floor. Building-Room / Location: e.g. FG5-FG103. Explanation: The printer is located in Falbesgate 5, room 103, i.e. ground floor, room 103. The printer is then installed. Click: Finish. You can choose to set the printer as the default printer. Multi-function printers (MFP) by Ricoh or Sharp; copy, scan and print. Many MFP printers are equipped with the Pullprint function, i.e. they have card readers that authenticate the users before letting them choose what to do. E.g. printers of the brand HP Laserjet.Only prints colour printouts. Pullprint printers allow you to copy, scan and print. However, they require the use of access cards that must be scanned on the card reader attached to the printer. A pullprint print queue is a queue consisting of several printers available throughout Campus. Multi-function printers (MFP) can also be used for copying. Copy: Press the Copy button in the top left corner, next to the display. Use the MFP as a regular photocopy machine. Contact itservicedesk@oslomet.no in case of difficulties. Multi-function printers (MFP) can also make scans and copies. Scanning: scan your card on the card reader for authentication. Select E-mail on the display. Only the feeder on the top can be used for scanning. The sender and recipient is yourself. You will receive a PDF, or any other format you choose, as an email attachment. This may take some time. Points that you should review in case of printing problems before contacting the IT service desk. In case of errors with a Ricoh printer, contact Ricoh’s service telephone. All OsloMet's PCs should have Pullprint installed. If you are using an OsloMet PC without Pullprint, you can install it here. If a printer is out of toner, contact the service telephone of the printer in question, e.g. Ricoh, see Order Toner. If a printer is out of paper, contact the administration at your department / unit. This is the department's responsibility. If you need to print several pages, we advice you to test the printer first by printing only the first page. If it comes out fine, you can print the remaining pages. You may also want to divide large printing jobs into several parts. E.g. by first printing pages 1-50, then pages 51-100. If you do not have access to the printer on your machine, you must add it again. If you have recently changed your password, you will not be able to access the printer(s) added to your personal computer (PC / Mac). The message usually reads “Server offline”. In this case you must add the printer again. Go to the printer intallation guides.